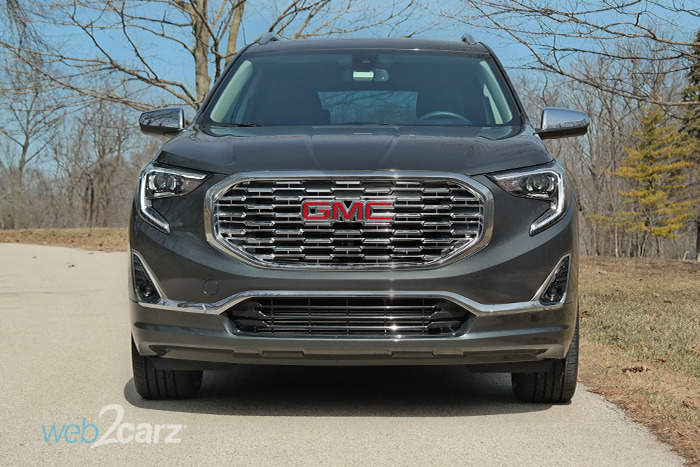 GMC has cut the Terrain's weight and made it smaller, which should bode well for the driving experience. While both help, some crucial details hamper higher ratings. Ride Quality: The Terrain is well-balanced in the ride department, managing bumps and gaps well. 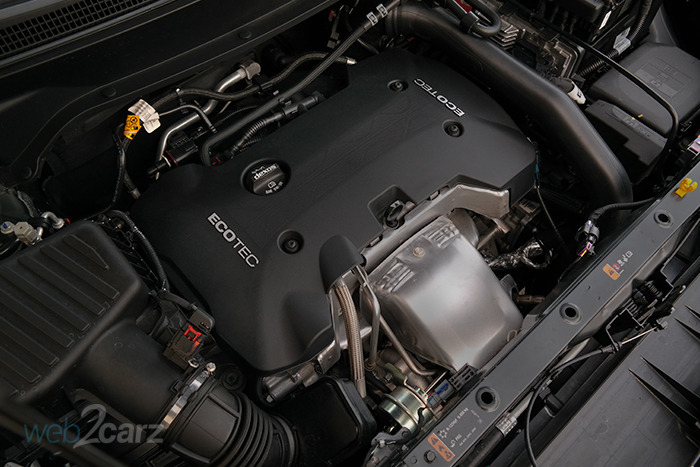 Acceleration: Our Denali came with the 252 hp 2.0-liter turbocharged four-cylinder. Acceleration is pretty strong, hitting 60 from 0 in the high six-second range, and the 9-speed automatic is smooth and quick. Braking: The brakes are nice and progressive with no mushiness or grabbiness. Steering: The one big demerit in the driving experience is the Terrain's numb steering. Though it responds well to inputs, the feedback is virtually nonexistent. Handling: The Terrain manages body roll pretty well, but the heavy nose pushes too hard if you force it in the curves. 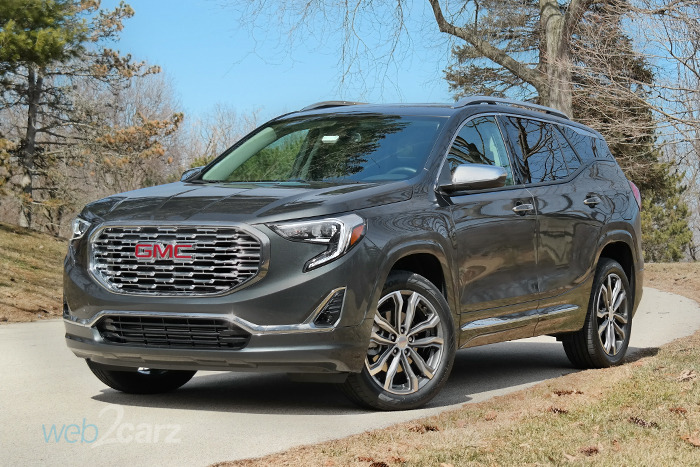 We were blown away by the Terrain's excellent in-car tech, and GM puts the tech suite at the top of the heap in the industry. 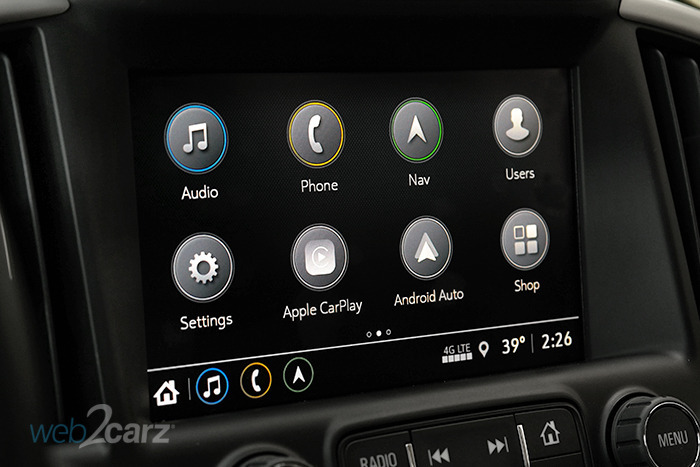 Infotainment System: GMC's IntelliLink system with an 8-inch touchscreen is superb. Big, clear icons and a highly legible screen with good response. 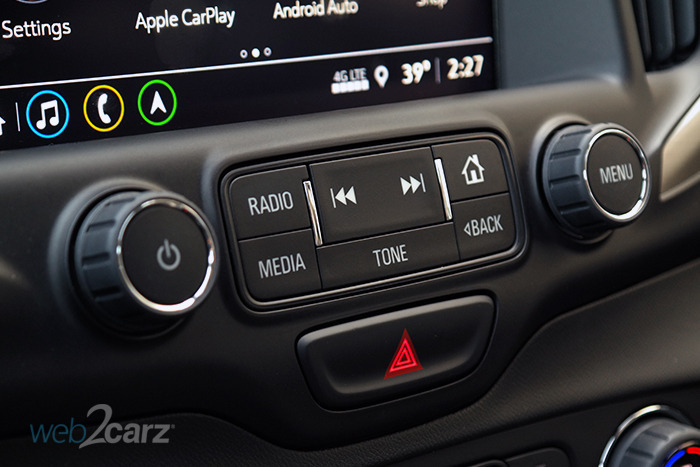 There's also navigation, OnStar 4G LTE Wi-Fi hotspot and Bluetooth. Controls: The buttons and knobs make easy work of navigating the various functions. Too bad attempt at making unique shifter controls failed miserably. The pushbuttons for park and neutral and the toggles for drive and reverse take serious getting used to. It might save space in the center console, but the novel system is too hard to use. It's a huge departure from the last Terrain, and we think it's a good one. Too bad there's just too much chrome. The interior is the truly disappointing part. Front: We have mixed feelings. While the front is dramatic with the big grille and C-shaped headlights, the preponderance of brightwork makes it look like it's wearing braces. Rear: The taillight shape mimics the headlights nicely, but the rear glass looks a bit short. Profile: It looks distinct, but there's still too much chrome, and we're not sure why it has to cut in on the D-pillar's floating roof look, which we don't like anyway. Cabin: Overall, it's not bad inside in terms of aesthetics, but the hard plastics and GM parts bin betray the price point. The Terrain is a very nice place to sit in both rows, and there's a surprising degree of space and comfort in the second row, making it ideal for passengers on longer trips. Front Seats: Big and wide, the front seats are very comfortable. Rear Seats: The rear seats, recline and also provide heat in the outboard positions. There's ample room back there. NVH (noise/vibration/harshness): The Terrain is quiet inside with turbo four's noise under hard throttle as the only real intrusion. Visibility: Good visibility in the front and sides, but the D-pillars and short rear glass compromise things out back. Climate: The climate system works well, and the heated/ventilated seats are excellent. Overall, the Terrain is a safe vehicle, though it misses top marks by a slim margin. 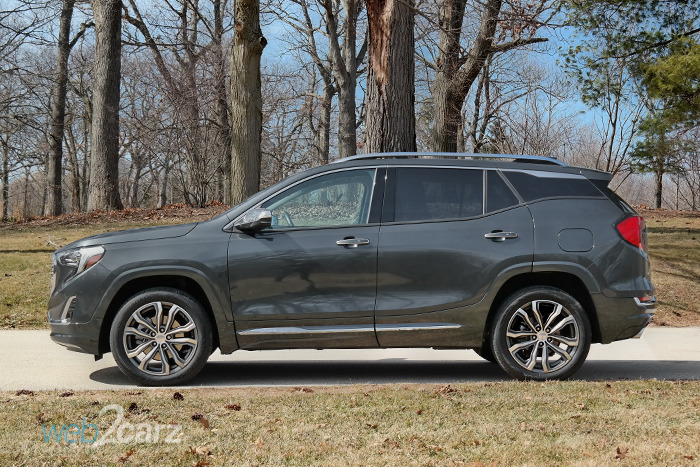 IIHS Rating: The Terrain nailed almost all the tests, getting 'good' in all crash tests, and scoring a 'superior' in accident avoidance tech, but it got dinged for poor headlights. NHTSA Rating: It scored four stars but suffered a little in the side impact crash test and rollover. 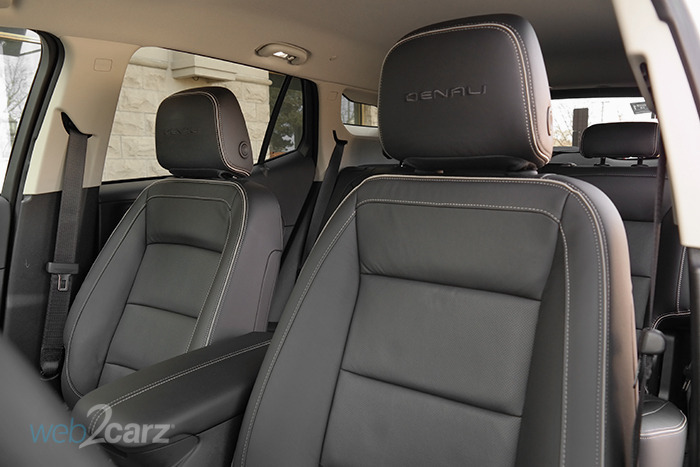 Aside from the in-car tech, the Terrain Denali shines in terms of storage and cargo capacity. Storage is certainly not a weak point in the Terrain's game with nooks and crannies to stash stuff everywhere. There's a massive center armrest compartment, door pockets and a slot on the passenger's side of the dash sized perfectly to accommodate a phone. At the front of the center console sits a sizeable area to hold more belongings, opened up thanks to a new push-button transmission shifter at the bottom of the center stack. Storage Space: At least the lousy shift buttons make room for huge amounts of center console space including a big cubby and large armrest. Door pockets are also capacious. The front passenger also has a nifty cutout in the dash for a smartphone, etc. 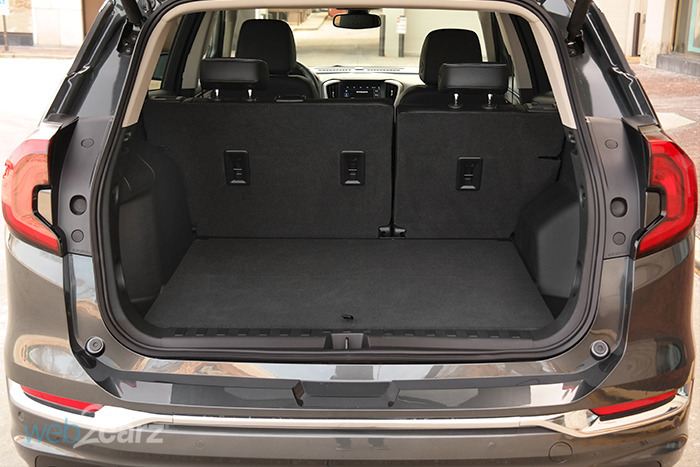 Cargo Room: There's 29.6 cubic feet of space behind the second row and a large 63.3 cubic feet with the seats folded flat, not as big as the Honda CR-V but more voluminous than the Mazda CX-5. Though the Terrain is now lighter, and the turbo four more efficient than the last model's V6, our returns weren't superb. That being said, we tend to push cars harder than average when we drive. Driving Factors: We drove locally and on highways in just about equal measure. We were generous with throttle, so the Terrain will likely do better under more conservative driving habits. The standard seven-speaker Bose audio system with amplifier that's in the Denali trim sounds great with crisp delivery and good bass. We enjoyed listening to it, and it's nice that you don't have to pony up for it when you get the top trim version. Final Thoughts We're happy to see GM rework their Terrain since the last one seemed pretty outdated in terms of tech and appearance. The result is a crossover that's distinct and roomy but still flawed with a bit of overstyling, weird transmission buttons, some cheap interior details, and steering that's lifeless. On the plus side, the Terrain's body looks right for the price, and the engine feels strong and responsive. There are better crossovers out there for the money, but the Terrain is still pretty good.